Pistacia chinensis, commonly called pistachio or Chinese pistache, is native to China and the Philippines. Despite its common name, it does not produce edible nuts. It is a deciduous tree that typically grows up to 35’ tall and 30’ wide. It should be pruned when young to maintain a rounded canopy shape. Chinese pistache are dioecious, meaning each tree is either male or female. The female trees bear tiny red fruit that turns dark blue. These red berries are attractive in wreaths and bouquets. The peeling grey-brown bark contains an inner layer of salmon-colored bark. The most striking characteristic of the Chinese pistache is its intense fall color. 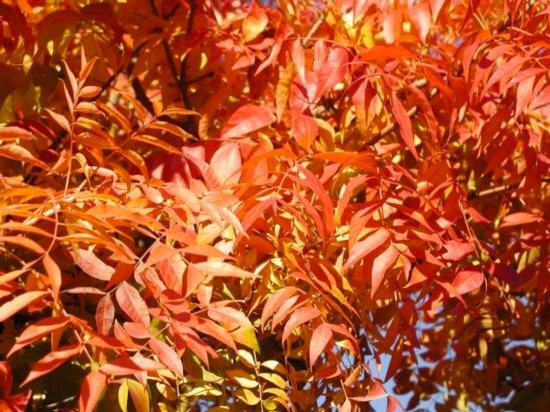 The 10” leaves, comprised of 10-12 leaflets up to 4” long, are dark green in spring and summer and turn brilliant shades of yellow, orange, and red in the fall. The foliage also emits an aromatic fragrance when bruised. This tree prefers moist, organically rich, well-drained soil, but performs in heat, drought, and a wide range of soils. 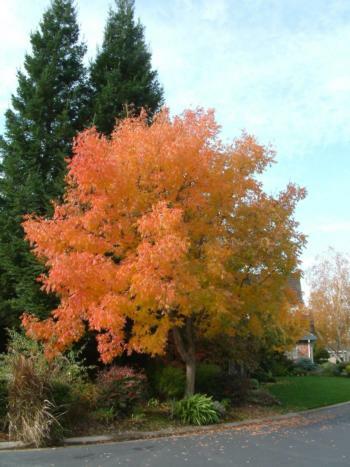 Chinese pistache tolerates light shade, but the fall color will be best in full sun.